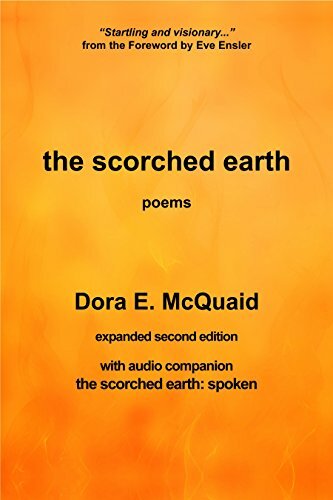 Synopsis: the scorched earth is Dora E. McQuaid's groundbreaking collection of poems about her journey from victimization to survivorship, through healing from a history of both sexual and domestic violence into empowerment and advocacy as an award-winning poet, activist, speaker and teacher. The audio companion, the scorched earth: spoken, is a studio recording of Dora performing all 35 poems from the 2015 Expanded, Second Edition of the book, with seven additional poems in this 2015 Edition as compared to the original edition released in 1999. 7 new poems since the original 1999 edition of this collection. Poems from this collection are used nationally in outreach and rehabilitation programs for survivors and perpetrators of violence, as well as law enforcement training and college and university courses. Dora self-published this book in 1999, with the compact disc companion being released in 2002 at the request of the cofounder and then-director of the Pennsylvania Coalition Against Domestic Violence, Susan Kelly-Dreiss, for use in training programs she was facilitating across the state of Pennsylvania. "Betrayal, followed by wreckage, followed by grace. Domestic and sexual violence, at their core, are a betrayal, and denial, of the humanity of both the victim and the victimizer. The wreckage that follows from these experiences impacts many lives beyond those of the victim and the offender, often threading out in insidious ways in ever-widening circles within relationships, families, communities and society at large until the violence itself has been acknowledged and the process of healing has the opportunity to begin. In the face of the experiences of such violence and the many possibilities that open before us in the healing that may follow, I am convinced that the possibility of grace always exists, and that grace holds us and uplifts as we find our way, returning us to a place within ourselves where hope can thrive. As a survivor of both domestic and sexual violence, I am living proof of the possibility of both that hope and grace, as my own healing and unfolding have been marked by the unaccountable presence of both. This book, which I first self-published sixteen years ago after experiencing violence that demanded I acknowledge the history and impact of violence in my family lineage that perpetuated itself into my own adult life, is testament to that grace, and the hope that it offered to me, at such a pivotal time in my life. ...This book is the first part of my story. I hope the poems within it speak to some voice inside of your heart. And may you be held in grace and returned to the possibility of hope again and again, no matter your own history, in the unfolding of your own life."